Adobe Creative Cloud: Does it change everything? All Adobe apps, is this a good thing? Unless you’re superbly enthused about the cloud features, the change from Creative Suite to Creative Cloud really only changes one thing: the way we pay for Adobe products. 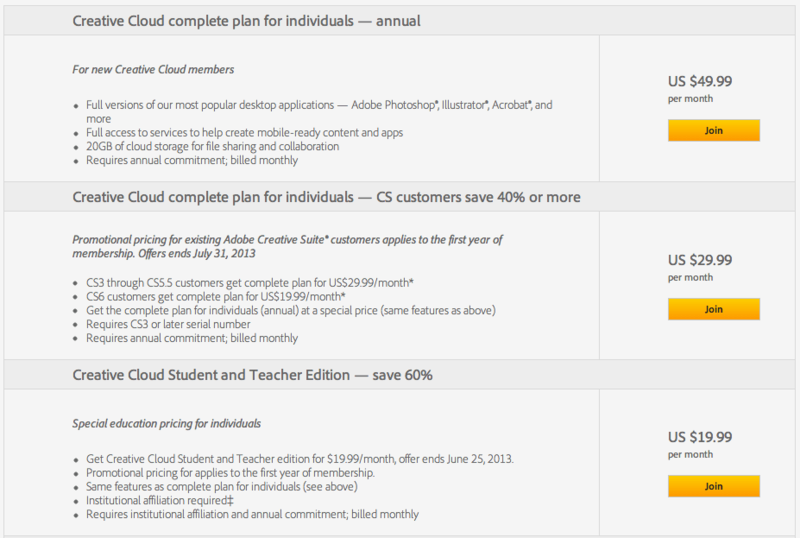 Adobe has made a huge change in their software pricing model. Now instead of paying a large sum to get into the game ($1500) and then a smaller sum to stay up to date each year ($400) Adobe will now make you pay monthly. So, the question is: Is it worth it? This is the customer who is jumping into production RIGHT NOW. Here’s their cost over the next three years in comparison. This is predicated on what Adobe previously said: new CS version every two years, new sub-version every year in between (ie 2012=cs6, 2013=cs6.5, 2014=cs7). Costs of products based on amazon/adobe. Lets assume if CS was sticking around that cs 6.5 would be the current version. Our time frame will be June 2013-June 2016. You may have noticed I included two seats per CS6 copy. In reality you are only supposed to have one license per person but that person can install the CS on two computers. This is to allow someone to have it on their work machine and laptop. In some cases (including on occasion here) companies will actually use it for two people. Adobe has said this is not as intended, and against their EULA, so you may want to compare row 1 with row 2 to see the actual savings when following the license rules. If you follow the license rules and are new to CS/CC then CC will actually end up being cheaper monthly/overall. Approximately $550 overall savings and $15.29/month (for one seat/one license) over the three year span. If you cheat and use one license for two people then CS is more valuable, saving $1350 overall and $34.70 monthly (paying for two CC licenses and only one CS license). UPDATE According to Adobe: http://forums.adobe.com/message/4379859, the license for CC works exactly the same as CS. You can have two computers licensed with one CC account. According to the EULA you can only use instance of the software at a time but there is no technical restriction different from that of the CS versions. If you plan to use Adobe CC in this fashion then the cost savings is actually much for CC. I’m sure we can put off an upgrade for a while. Even though these are some great features we have a workflow that solves many of these problems. We have Video Copilots Element 3D which will work with e3d and c4d objects in a similar manner. Mocha/boujou for camera tracking. The one feature that is interesting but NOT worth the cost of CC is the shot matching in CC. Why did it take so long to get this obvious feature? Every current CS customer is going to have to make their own call on this. You have to ask yourself, are the features worth the upgrade right? For us it would cost $89.97 a month. Two CS6 upgrades (one PC, one MAC) for $19.99/month, and one new subscription at $49.99/month. Is the CC worth $90/month for us? Probably not. We may try one version however at $19.99/month just to get a taste for Creative Cloud moving forward. Clearly if we want to stick with Adobe we will have to upgrade. The question is when. Now I put the question to you. Does this change everything? Is the pricing better or worse for you? Are you still waiting for Final Cut Pro 8 now that Apple has announced a new Mac Pro? It’s not web based or run in browser. They are normal applications! Read more about Adobe Creative Cloud on their website.